Lots of campaign activities from this past weekend and much of it posted on Facebook for supporters and fans to check out. Have you connected with us on Facebook? "Like" our page here: https://www.facebook.com/iltruthteam. Illinois Comptroller Judy Baar Topinka hosted and participated in an 'adopt-a-pet' event in the City of Chicago. Post by Judy Baar Topinka. 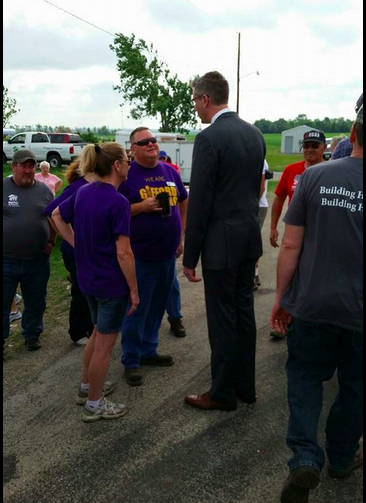 Illinois Attorney General Candidate Paul Schimpf and supporters walked in a parade in Marine, Illinois. Great campaign slogan, right? Post by Schimpf for Illinois. After four months of no activity on the official Mike Webster for Illinois Facebook page, there was some action: they updated their cover photo with some new red/white/blue imagery. If you check out his Twitter handle (where...we'll be honest...he's been a bit more active) the imagery matches up. Thus....we here at the Truth Team are thinking this is his go-to-market iconography. Looks like he's ditching his blue and gold scheme that is still on his site. Now, we know that this campaign against incumbent Secretary of State Jesse White isn't going to be on Facebook and Twitter and the web alone. But...we need to make sure as a Party we field a strong slate of folks all the way and down the ballot to encourage every voter to give our Republican candidates a strong look. We'll be doing our best to spotlight news and issues that Mike Webster's team bring to light. Let's have an honest debate about the office and discuss the issues that matter to voters. With this story going into it's second week, we have to wonder, what exactly is Mike Frerichs and his campaign hiding? Must be some nasty stuff for him to stonewall voters from seeing what he's been up to in the Illinois State Senate. Now, Tim Schneider, the Chairman of the Illinois Republican Party has set a deadline for Mike and his crony John Cullerton to come clean: he's given them 7 days to release the public information before they turn to the Attorney General. 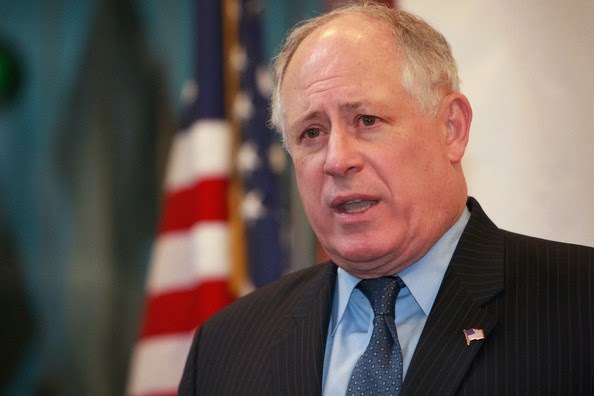 Illinois Republican Party Chairman Tim Schneider today again called upon Democrat State Senator Mike Frerichs and Senate President John Cullerton to release records as required under the Freedom Of Information Act (FOIA). To date, release of these records has been denied. Speaker Mike Madigan has already released nearly identical data on Representative Tom Cross, as requested by the Frerichs campaign. If the records are not released in seven days - by Monday, July 7 - the party will work with the FOIA filer to submit an official Request for Review of the denial with Attorney General Lisa Madigan’s office, as set in state law. The FOIA requests detail how Frerichs has spent hundreds of thousands of taxpayer dollars in office – important information to know for a candidate running for state treasurer – and to disclose what role he may have had in the scandal-plagued Neighborhood Recovery Initiative and possible illegal hiring at the Illinois Department of Transportation. Repeated requests have been denied by the FOIA officer representing Senate President John Cullerton. Cullerton donated $50,000 to Frerichs’ campaign in March, 2014. Talk about great campaign 'optics', right? A campaign is fighting to keep information out of the public's hands? Fits into a pattern, doesn't it? The voters love to hear about candidates who refuse to release info. By now, you've heard this crazy bit of news: Mike Frerichs, a candidate for Illinois State Treasurer is having his cronies in the State Senate refuse to release the records of his time there. When operatives for Democratic state treasurer candidate Sen. Michael Frerichs sent Freedom on Information requests to the Illinois House Clerk for lots of files on his GOP opponent Rep. Tom Cross, the House complied. But Cross’ people have asked for most of the same documents from the majority Democratic Senate and have been denied. ...The Cross people are understandably upset about this, particularly since President Cullerton is Frerichs’ single largest donor this year. But, the plot thickens. Apparently "Tax Hike" Mike - as the locals call him - has been learning these shady campaign tricks from one of the best! State Sen. Mike Frerichs, the Democratic nominee for State Treasurer, attended four separate events held for him on Saturday, June 21, in Lyons Township. Democratic committeeman and fellow state Sen. Steve Landek, along with his local Lyons Township Democratic Organization, sponsored the four events across the township on Saturday starting as early as 7 a.m. So...you guys remember Christopher Getty, don't you? Oh...you don't? Allow us to give you a refresher: he's the guy who is the current mayor, but also requires taverns and bars in town to buy their liability insurance from his family firm. Oh...and then to make matters worse for taxpayers? Mayor Getty and his administration refused to release any public documents. Lyons bar owners are turning to their village president's company to buy liability insurance, and town officials refuse to release related public documents, saying some are "under lock and key." The refusal to release public records sets up a test for the Illinois attorney general's newfound powers to force reluctant local governments to turn over documents. And the potential conflict of interest could add another note to the western suburb's seamy past with clout and nightlife. Purchasing liability insurance from Village President Christopher Getty's company is what one former club owner described as "just the way it is" in town. Getty believes in an 'open and transparent government'. Just like Mike Frerichs. 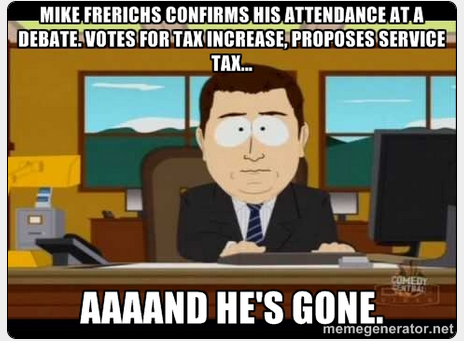 Now Frerichs' failure to release any documents from his time in the State Senate makes total sense. He's learning from the best including folks like this allegedly sleezy dude Christopher Getty. And he wants to be our State Treasurer? What's he going to do? Shake down firms in Illinois to do business with his family biz in order to do work with the Treasurer's office? 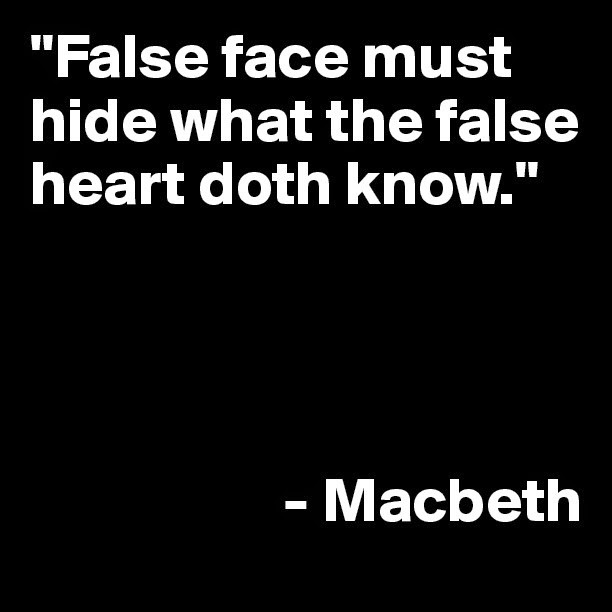 If we are to judge a person by the company that they keep, that'd be a fair guess. Man-o-man. You want to talk about a fired up campaign? Just take a look at this packed house at the latest Mike Frerichs event. This time he was paired up with Congressional candidate Ann Callis. 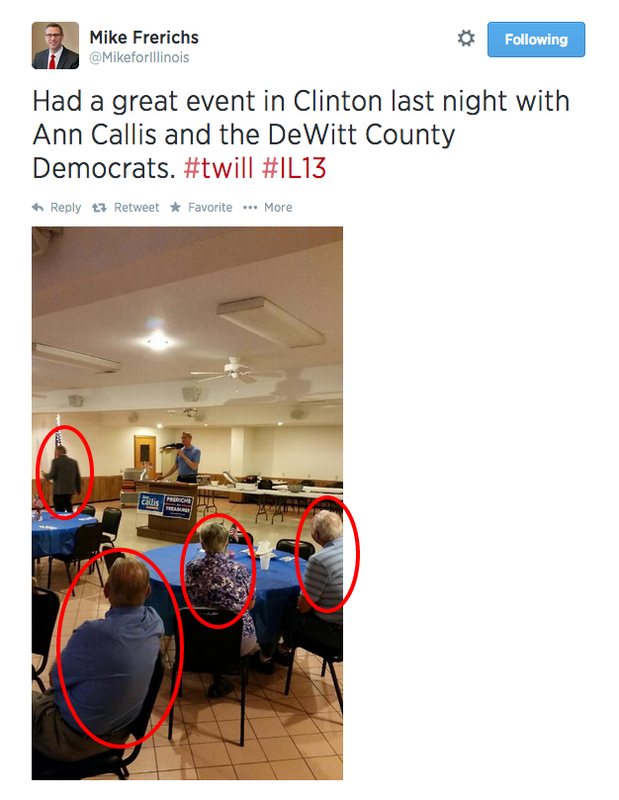 At what Frerichs called "a great event" as he crowed about it on Twitter, we count four people. Yes...four people. Wow. Forget all that chatter about the enthusiasm gap, right folks? To make it easier to count, we went ahead and circled in red the folks who attended this "great event". Perhaps Big Mike Frerichs and his team should be thinking twice about what they're posting to their social networks. This isn't exactly sending the right signals. If I was Ann Callis and her team, I'd be running - as fast as I can - away from Team Mike Frerichs. I wouldn't want to be sucked down that hole that always seems to be created by his own mis-steps. Dem Watch: How About That Benton Cook III?!? Let's call it his third bit of bad luck, shall we? First, Benton Cook III - the husband of Cook County Circuit Court Clerk Dorothy Brown - got wrapped up in Governor Pat Quinn's Neighborhood Recovery Initiative. You remember that crooked program, right? Cook became a lightning rod for criticism of Quinn’s Neighborhood Recovery Initiative following Chicago Sun-Times reports that he was hired to help supervise $2.1 million in anti-violence grants despite having a felony conviction for writing bad checks. Cook didn’t work directly for the state, but for a not-for-profit group that paid him $146,401 in salary and benefits over 22 months out of the state anti-violence funds. Separately, state regulators filed a complaint against Cook last month accusing him of misrepresenting himself as a licensed clinical psychotherapist and offering psychotherapy services on a website. Cook is fighting that complaint, saying he never offered such services. On his resume, “Benton Cook III PH.D” says he did “doctoral studies in clinical psychology” at the Jacksonville Theological Seminary and was a “professor of psychology” there between May 1999 and May 2004. He also says he has a “masters of humanities in psychological counseling” and a bachelor’s degree in “religion and biblical studies” from Aspen Theological Seminary. Before he was paid more than $146,000 for work on Gov. Pat Quinn’s scandal-plagued anti-violence initiative, Benton Cook III says he spent four years as a “media production director” for political candidates. 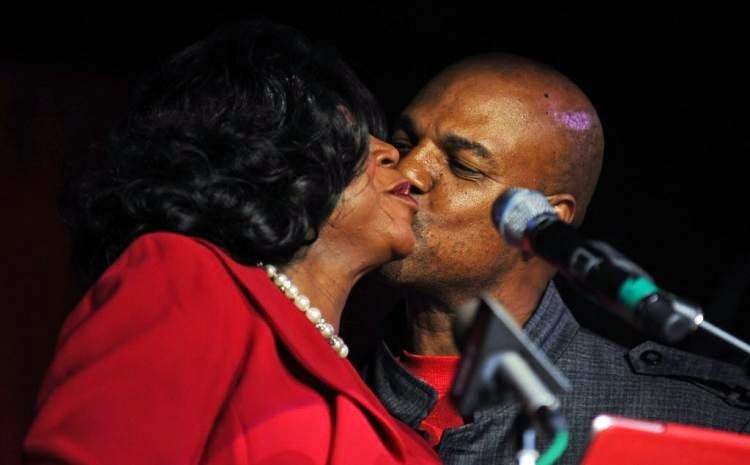 His biggest client, as it turns out, was his wife, Cook County Circuit Court Clerk Dorothy Brown, records show. Brown’s campaign fund paid the video production company based at her husband’s then-South Side home nearly $90,000 over a four-year period ending in 2010, according to Illinois State Board of Elections records. The business, Gideon Video Productions, doesn’t appear to have been licensed with the state of Illinois, the city of Chicago or Cook County. Just a string of bad luck, right? Those pesky reporters from the Chicago Sun-Times should stop digging around on him. 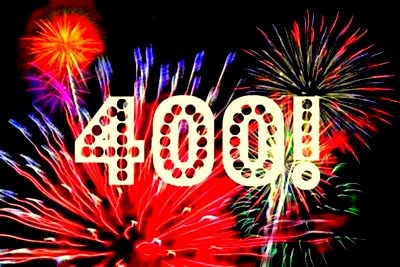 Hard to believe that we've made it to 400 unique posts here on the Illinois Truth Team. It was just back in February that we crossed the 200 post mark. Check out the post here. What started all the way back two years ago in June of 2012 has become a fun, creative outlet in discussing the days news in Illinois politics. Thanks for reading along. Can't wait until the November elections. Voters doing a search for our favorite latex salesman Candidate for Illinois State Treasurer Mike Frerichs on the Google come face to face with what either is another in a long string of errors coming out of his campaign or a super weird attempt to win over the "vocal fry" crowd. We think it is pretty 'obi' that he's trying to win the young folks over, amirite? 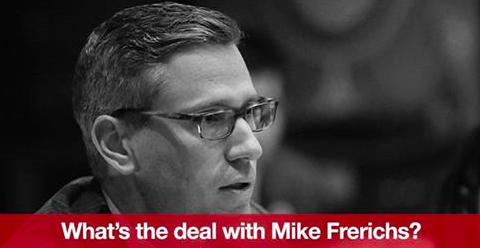 We know that the 'vocal fry' community is a super important constituency for Mike Frerichs. Why else would he be prattling on so much on Facebook? And...all this talk about "ducking" out on debates this week? That isn't a problem, you know. All the rage these days is the "Duck Face" in selfies. By 'ducking' out on the debate, Mike Frerichs is just pandering to the 'Duck Face' crowd. Duh. If you were more tuned in you'd know these things. But...the capper on the whole thing? We all know that Mike is desperate for attention, but how can he connect with these other folks who are so enamored with themselves that they take selfies and post them on Instagram with dozens of #hashtags? What can a political candidate do to demonstrate their commitment to the cause? You get hip by shortening the name of the office you're running for! It would be so "awks" to have to say the whole thing, right? Let's shorten it to "Treas". Nice work, Frerichs Team. That's micro-targeting at it's best! 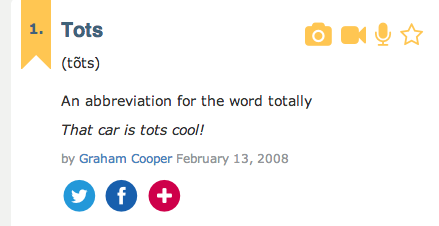 You'll tots make a fetch Treas, Mike. What's that? You don't have plans tonight? Well...then you better get out and head down to Urbana and meet us at Illinois State Senator Chapin Rose's Annual Champaign Area Summer Reception. Congressman Aaron Schock was working against his fellow member of the Illinois Congressional Delegation Peter Roskam last week in his bid to become the House GOP Whip. Schock was with the guy from Louisiana. 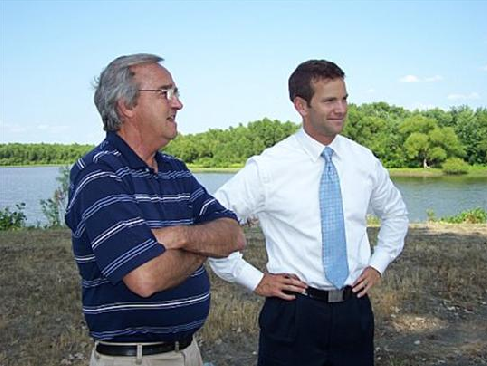 There was plenty of speculation about what Schock was angling for in return for his loyalty. Most folks thought he was going to get the plum job that Roskam was vacating: Chief Deputy Whip. Nope. Schock didn't get that. But he did get the next best thing. Incoming House Whip Steve Scalise, R-La., is replacing Rep. Peter Roskam, R-Ill., as chief deputy whip, tapping Rep. Patrick McHenry, R-N.C., for the post. Roskam, currently the chief deputy whip, lost his own bid to move up to the whip post last week with the Scalise victory. Rep. Aaron Schock, R-Ill., an active Scalise supporter, was named by Scalise to be a senior deputy whip. 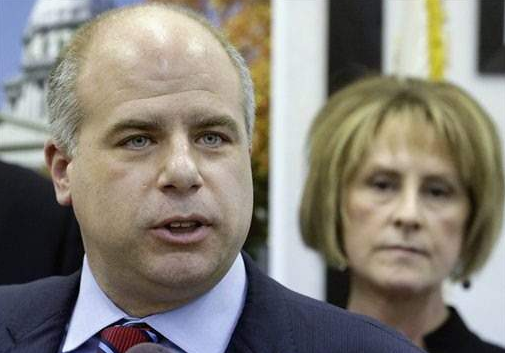 State Representative Ron Sandack is keeping the pressure on to get to the bottom of the mess that Illinois Governor Pat Quinn's Neighborhood Recovery Initiative has become. He says, rightfully, that the bipartisan committee "owes it to the taxpayers to find out" the details and the parties involved. Good on Sandack. Go get 'em! If you were at the helm of this corrupt, scandal-ridden mess would you want to face the music? We know that we sure wouldn't. Gov. Pat Quinn has rejected a challenge to testify before a legislative panel looking into the scandal-plagued anti-violence program Quinn created before the 2010 election. WBBM Newsradio Political Editor Craig Dellimore reports Quinn said he has no intention of facing questions from the Legislative Audit Commission, which is looking into the Neighborhood Recovery Initiative, has subpoenaed a number of the governor’s aides and other state officials. Earlier this year, Auditor General William Holland issued a report finding NRI had major problems with mismanagement and spending. The report said the program was so hastily organized and sloppily executed that auditors questioned 40 percent of the expenditures claimed by service providers. The program is now under investigation by state and federal prosecutors for how $55 million was spent. 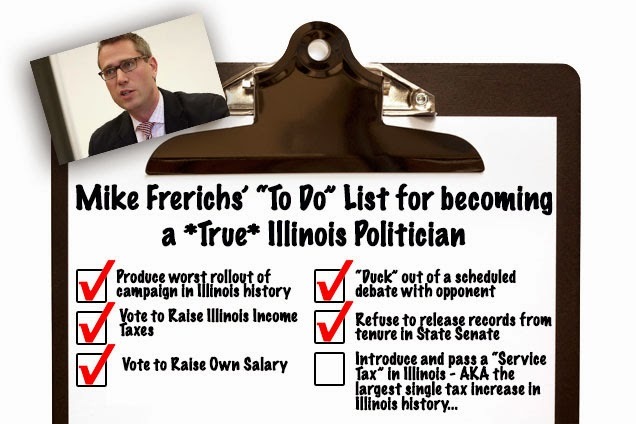 We got our hands on Democrat candidate for Illinois Treasurer Mike Frerichs' 'to do' list. We were just told we should consider this his "Honey-Do" list for his campaign. Let's not let him achieve his goals. Tell your friends that we need to stop this bozo before he even gets started. 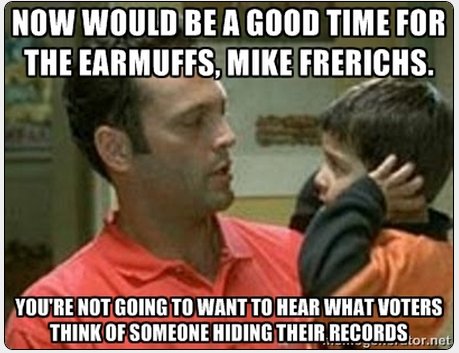 By now, you likely know how much Democrat State Senator Mike Frerichs from Champaign loves to wear earmuffs. You can see the history of his fashion choice here on this post from the Truth Team. But the muffs? We think we finally have an answer! Turns out, he can't stand to hear all the clamor around his campaign about the mistakes he's made. The easiest way to tune that stuff out? Earmuffs, of course. We were tipped this by one of our fine readers. Mike Frerichs can pound away on his keyboard prattling on and on posting to his Facebook Wall, all the while wearing those earmuffs. "I can't hear you...I can't hear you." But...now that he's compounding his problems by first 'ducking' a debate? And now refusing to release his records from the State Senate? The noise is about to get worse, Mike. Brace yourself. What Could State Senator Mike Frerichs Really Be Hiding? Must be some really incriminating stuff, right? 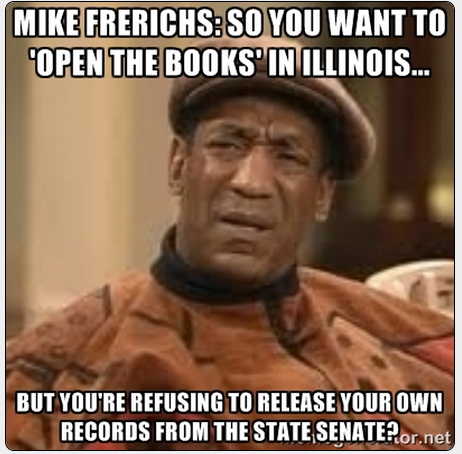 Why else would Mike Frerichs have his stooges refuse to release information from his tenure as an Illinois State Senator? Wouldn’t they all be public records? What “private records” are the Senate holding on to? Stupid politics by the Senate Dems. Makes it look like there’s something to hide. Different party… they could at least be honest with us and just say it’s political, that would be the decent thing to do. Just another example of why people have lost faith and trust in government at all levels. Sorry, Mike. The drumbeat on this issue is only getting stronger. This isn't going away. Transparency in our elected officials is on the top of every voter's mind. What you're doing? Stonewalling. Those earmuffs you so clearly adore won't help you drown out the problems this has created for your campaign. Whatever reason you're hiding this stuff has done more damage to your campaign that whatever is likely in those documents. 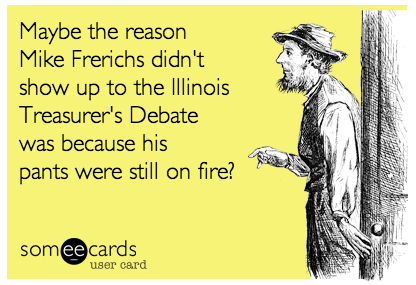 Add this to the pile of mistakes the Frerichs for Illinois State Treasurer campaign has made. On second thought, those earmuffs might give you some comfort today. Go ahead. Put 'em on. We won't tell anyone. Mike Frerichs' largest campaign donor (according to Capitol Fax) is State Senate President John Cullerton. He's the same guy who's refusing to release any of the records from Mike Frerichs' tenure in the State Senate. Coincidence? Not in Illinois. Not with Democrats. 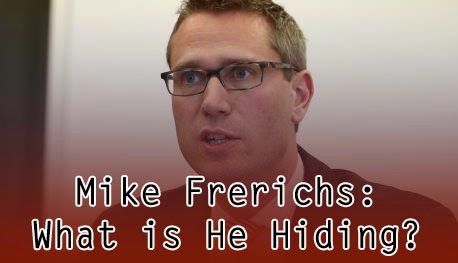 What Is Illinois Treasurer's Candidate Mike Frerichs Hiding? 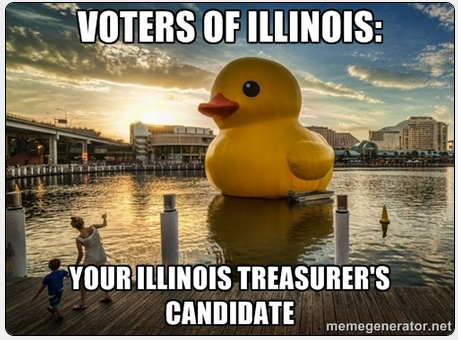 First Mike Frerichs - Candidate for Illinois State Treasurer - 'ducks' a debate by not showing up. Now, he has his cronies in the Illinois State Senate (where he serves) putting 'a brick' on the release of any information about his time there. Yeah...that's right: his team in the State Senate is unwilling to release information about how Mike Frerichs was involved with Governor Pat Quinn's notorious Neighborhood Recovery Initiative and hiring practices. So...what's Mike Frerichs hiding? What's he afraid of? Why shouldn't taxpayers know what his involvement was with this mess of a program? Why shouldn't we know who he hired? The Senate president's office, asked by a consultant to the Cross campaign for information about Frerichs' seven years in the Senate, so far has asked that the request be narrowed, but has not released the information. Much, but not all, of the information sought is similar. In a follow-up request from the Cross consultant, KEVIN WRIGHT, he asked the Senate for any electronic or paper correspondence from Frerichs related to a couple of controversies. One is the Neighborhood Recovery Initiative pushed by Gov. PAT QUINN and now under investigation by authorities including the Legislative Audit Commission; the other is “hiring practices and/or recommendations” involving the Illinois Department of Transportation. The NRI, an anti-violence program in which more than $50 million was pledged toward fighting violence in Chicago, was announced shortly before the 2010 gubernatorial election. It has been the subject of a highly critical state audit citing lax spending controls. And some IDOT hiring over recent years has been criticized as improper patronage. In a June 6 letter to Wright, of Old Dominion Research Group, Alexandria, Virginia, ERIC MADIAR, the freedom of information officer for the Senate and chief legal counsel to Senate President JOHN CULLERTON, D-Chicago, called the request for information “unduly burdensome,” as it would involve years of emails and other records. Mike Frerichs Doesn't Seem To Be "Standing Up" Anymore? Seems like a fair question, doesn't it? Guess this is par for the course with the Mike Frerichs for Illinois Treasurer campaign: it started with a lie. Now his 'tagline doesn't even hold water'. And they just keep coming in! Mike Frerichs - affectionately known as "Tax Hike Mike" because he voted to increase YOUR income tax in Illinois and because he's proposed a massive 'Service Tax', decided that he didn't want to show up for a scheduled debate with his opponent Tom Cross in their race for Illinois State Treasurer. You can read the background on how he skipped out here. You can see the first meme that was sent in by a reader here. Now, our readers - as they always do - have come up with even more. Enjoy! 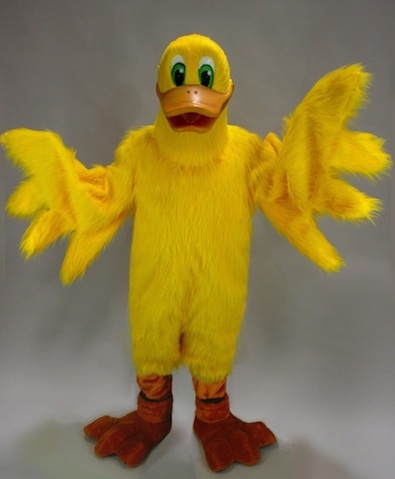 Over on the Capitol Fax blog, Rich Miller takes note of how Mike Frerichs 'ducked' out on the first debate of the Illinois Treasurer's race and even gives everyone an idea: what about a duck costume??!? PLAINFIELD…Democrat Senator Mike Frerichs ducked out of the first scheduled debate between himself and Republican Tom Cross. Frerichs had agreed to participate in the debate, hosted by Bill Cameron of WLS, but then ducked out. 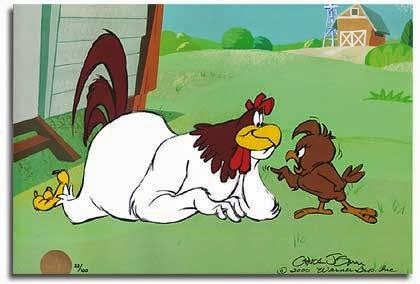 Looks like ole' Foghorn Leghorn will live to fight another day. News from the Chicago Tribune this morning has Kirk Dillard securing enough votes to be the Regional Transportation Authority Chairman. Seems like a good spot for Senator Dillard to continue on where he can have a seat at the big boy table. There is, in our opinion, some risk here. Metra is fubar'd. Seriously fubar'd. What happens to Dillard if things continue to go sideways there? Does he get some of that stuff to stick to him? Time will tell. 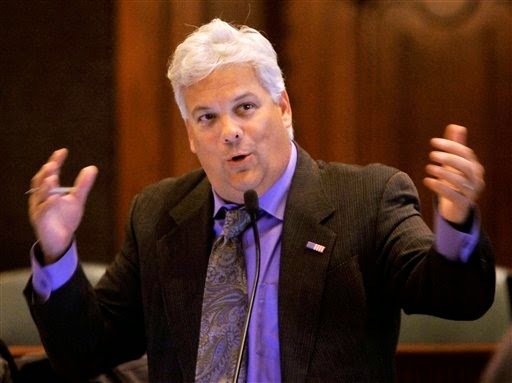 State Sen. Kirk Dillard, a Hinsdale Republican, says he has enough support to be elected chairman of the Regional Transportation Authority at its meeting Wednesday. Dillard, who was an unsuccessful candidate for the Republican nomination for governor, told the Tribune he believes he has the backing of a supermajority of RTA board members, the bipartisan support of suburban county political leaders and especially Mayor Rahm Emanuel. Chairmanship of the RTA board requires a combination of geographic and political support, which Dillard said he has garnered. The post pays $25,000 a year. By now, you've heard about how Democrat candidate for Illinois State Treasurer Mike Frerichs failed to show up for the first scheduled debate of the race with Tom Cross late last week. It was set to be a discussion on Chicago radio (WLS). You can read the background here. 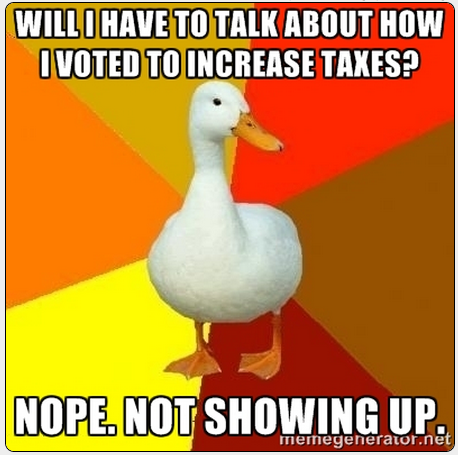 One of our fine readers sent us in this meme describing how "Tax Hike Mike *ducked* the debate. Can you do better? Drop them in our inbox at: tipthetruthteam@gmail.com. We'll post the best ones. Democrat State Senator Mike Frerichs ducked out of the first scheduled debate between himself and Republican Tom Cross. 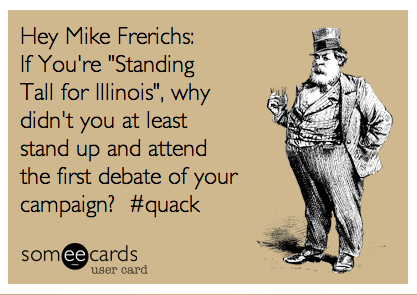 Frerichs had agreed to participate in the debate, hosted by Bill Cameron of WLS, but then ducked out. Even with Mike Frerichs’ absence, Tom Cross showed up on Friday to discuss his plans for Treasurer for the WLS news show Connected to Chicago, including his focus on balancing the state budget, cracking down on fraud and corruption, and ending the failed policies of Quinn/Frerichs. Mike Frerichs? He didn’t show. He ducked. 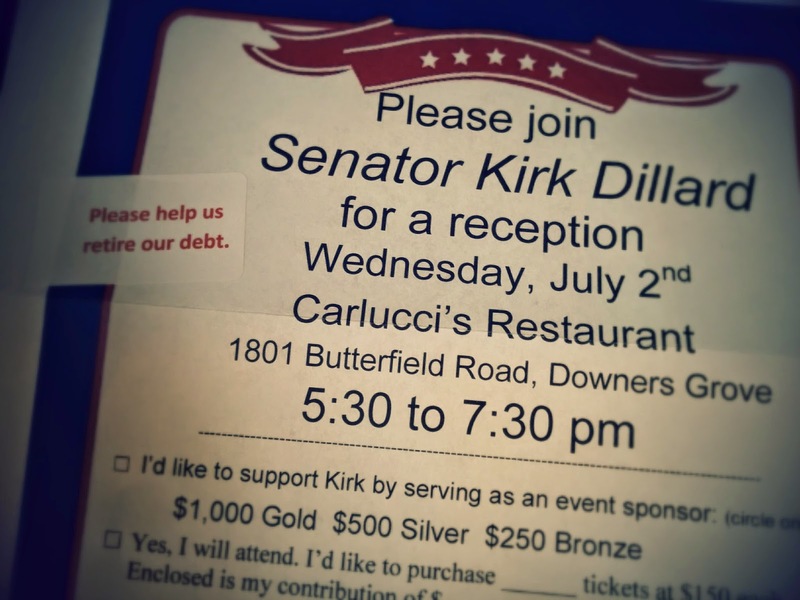 Good luck to Senator Dillard and his team - as this can't be an easy ask fundraising-wise. How can you want to support a guy who is riding off into the sunset after many great years in the Illinois Senate? Will you be there on July 2nd? 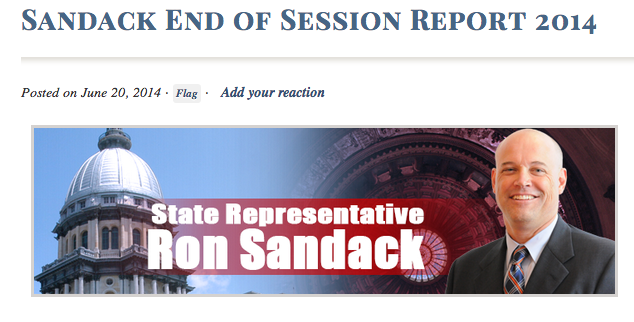 Representative Ron Sandack Releases "End of Session Report"
Illinois State Representative Ron Sandack - hot off the heels of his Silicon Valley junket - has released his 2014 "End of Session Report" on his site. You can find the full report here. In the report, he covers: the unbalanced budget, the lame-duck session issue, a jobs plan, and mass transit issues. This spring’s legislative session in Springfield was very difficult, yet very productive. Many good bills are on their way to the Governor for his signature. Unfortunately, bills that continue the State’s unhealthy spending habits and delay our return to solid financial footing are also awaiting the Governor’s signature. Personally, I was successful in getting 12 bills passed. These bills increase transparency and accountability, clear up ambiguities in existing laws, and promote good government in Illinois. You can go read the full report. He also has a survey up where you can give your opinion on issues facing Illinois. Take the survey here. We've taken the short 4 question survey, and can tell you that it doesn't take long. Go ahead. Over on the McHenry County Blog, Cal Skinner notes that State Representative Jack Franks announced his set of "Ice Cream Socials" across his district. Warm summer nights in McHenry County often bring together friends and neighbors for refreshing ice cream and lively conversation. In the spirit of that tradition, state Rep. Jack Franks, D-Marengo, will host four Ice Cream Socials in July. The Ice Cream Socials will be held in conjunction with community events across McHenry County. Audience members at the Wonder Lake Ski Show, band concerts in McHenry and Woodstock, and patrons of the annual Fay’s BBQ Fundraiser for the M.O.R.E. Center in Marengo will have the opportunity to engage with Rep. Franks while enjoying a free cup of ice cream. State Representative Jack Franks is taking the campaign seriously this summer and is doing what good politicians need to do: go to where the people are and not forget about why they're elected. Too often we see "Potomac Fever" from our Congress-people and on occasion we see the same "Sangamon Fever" out of our State Representatives and State Senators. Franks, for all his flaws including his support of Speaker Mike Madigan, understands retail politics and works his district hard each year. We need more hard-working elected officials who work as hard back home. Darlene Senger - who has been all over the Affordable Care Act - is at it again. This time, she wants answers on the $33M of marketing dollars spent in Illinois. Darlene is running against Bill Foster for Congress in Illinois. And she's talking about government waste, an issue that matters to all voters. Darlene Senger is calling for a state and federal investigation to examine the spending and costs associated with promoting the federal healthcare marketplace in Illinois. Last week, The Associated Press reported that Illinois spent $33 million in federal money to promote the Affordable Care Act or ObamaCare. The contract allowed public relations firm FleishmanHillard to bill at $270 an hour, far above rates paid at other states. Illinois ended up paying $37 per enrollee in the exchange, one of the highest rates in the nation. Sam McCann Stays Out of the Govenor's Race. Wisely. News out this morning that State Senator Sam McCann wised up and decided to stay on the sidelines in the fall Governor's race. State Sen. Sam McCann, after apparently working to have petitions distributed, issued a statement Tuesday saying he is not running for governor. These politicians are funny beings. They crave attention. Not all of it ends up - in the long run - being good attention. Time will tell for Sam. Big news coming out of the Western Suburbs: Congressional candidate Darlene Senger - having fought through a tough primary this Spring - is going to give Congressman Bill Foster a run for his money. Have you heard the news? Today the National Republican Congressional Committee named me to the "Young Guns" list. This is a BIG deal because they only do this for the challenger races they think they can win and plan on working in. This is great news for the campaign but it gets better from here. My race for Congress is already starting to tighten and it is still June! Just yesterday Crain’s released a poll showing that Bill Foster and I are neck and neck. 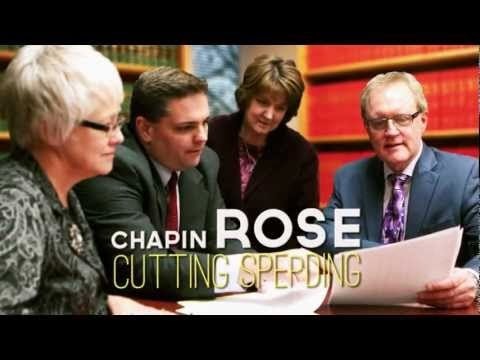 It is clear that voters are dissatisfied will Bill Foster’s record of more government, more taxes and more spending and are ready for a change. This Morning on Capitol Fax, Rich Miller reported on the poll saying "That’s not good news for Foster at all"
This is HUGE news for our campaign and more reason why we need to get out there NOW! And that is why I need your help today! Your donation of $100 will help get my message of reducing spending, cutting taxes and balancing the budget out all over the 11th District. Voters know it’s time for a change, electing the same people who created our country’s problems won’t be able to fix them. Can I count on your support today? A donation of $100 will go a long way in helping me defeat Bill Foster in November. 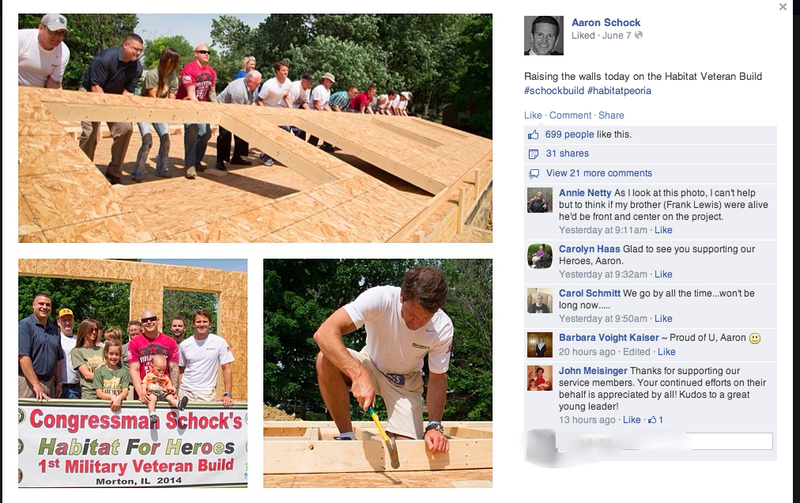 Congressman Aaron Schock took a break from his amazing Instagram life to lend a hand with a local Habitat for Humanity home build. And guess what? He actually got involved. He rolled up his sleeves, wore work clothes and actually swung a hammer. Good on him. Why is this even worth mentioning? Because...Congressman Aaron Schock did what almost EVERYONE would do in this situation: show up in the right clothes and get involved. What did Democrat Candidate for Illinois Treasurer Mike Frerichs do when he had the same situation? 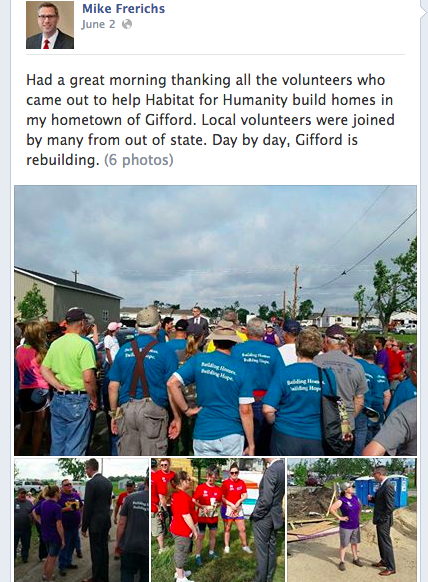 He used the disaster in his hometown and the Habitat for Humanity build as a photo opportunity and a chance to 'post this on Facebook' by showing up in a suit. And wingtips. Yes. A suit. At a Habitat for Humanity Build. Talk about a guy who is totally out of touch with reality. And he wants to be our State Treasurer? Come on. We're calling this #SuitGate. Check out the full details and background here. Or, start where it all began with Frerichs Facebook post showing him in a suit here. 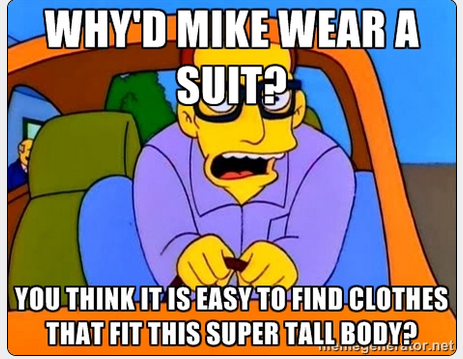 Turns out...we might not have considered all the factors in #SuitGate. The Mike Frerichs' for Illinois Treasurer "Standing Tall" camp has released a statement. And oddly enough...it surfaced in our inbox in the form of a Meme. Is that a good enough explanation for you? I'm sure you'll tell us via email if it isn't. Vote with your photoshop jobs. We'll post more if we get 'em. Mike Frerichs the Tough Mudder? That Suit Had To Weigh Him Down on the Twinkle Toes Bridge, Right? Wearing a suit to a Tough Mudder race is about the same thing as wearing a suit to a Habitat For Humanity build site. Sounds strange, right? But that's exactly what Mike Frerichs did last week. Talk about a tone deaf politician. 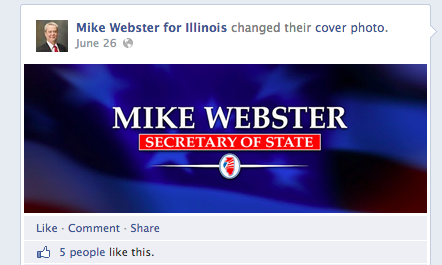 And now he's running for Illinois State Treasurer. A real 'man of the people' eh? Oh, what's that? He voted to raise his own salary last week, too? Sounds about right. Where else have you spotted Mike Frerichs? Was he wearing his signature earmuffs? 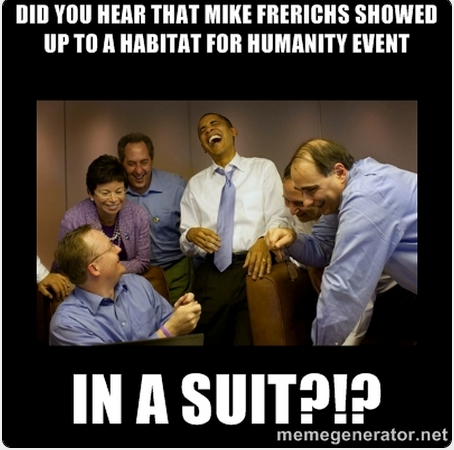 You know it is bad when Mike Frerichs' idol is goofing on him for the suit at a Habitat build. Full backstory here on #SuitGate on the Truth Team. Who Knew @MikeforIllinois Was a Parrothead? One of our readers sent us this photo they found on their iPhone of Mike Frerichs in the parking lot of a Jimmy Buffet concert. Who knew Earmuffs Mike Frerichs was a Parrothead? He sure hasn't been tweeting about his love for Margaritaville?!? Look who snuck in there? Guess the Leis don't go with his suit. 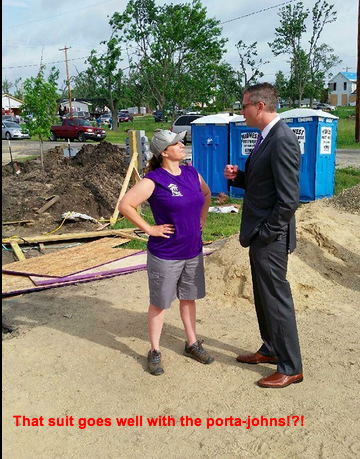 For those of you just checking in on this, you can get up to speed by reading about how the politically tone-deaf Mike Frerichs - who is running for Illinois Treasurer - wore a suit - and wingtips to a Habitat for Humanity build in his hometown. Then check out where else Mike Frerichs showed up in a suit? Where Else Can Treasurer's Candidate Mike Frerichs Show Up Dressed Inappropriately? We already know Democrat candidate for Illinois Treasurer Mike Frerichs is politically tone deaf. He votes for his own raise. He votes for an unbalanced budget. Both bad moves politically. But...what else does he do? He shows up at a Habitat for Humanity build event in a suit. A suit. Check out our post here on the details and photos. That got us wondering...where else have you seen Democrat Mike Frerichs show up dressed inappropriately? Here's a .psd file with a transparent background of Mike 'Earmuffs' Frerichs in a suit that can help in your adventures. Download it at this link. Drop us a line at tipthetruthteam@gmail.com with your best work. As luck would have it, one of our dear readers of the Illinois Truth Team was looking through their recent Spring Break photos and came across an odd photo. 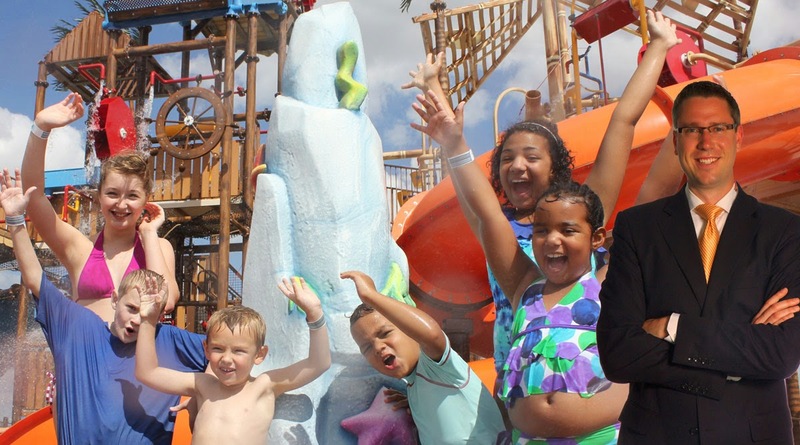 Somehow - while they were taking photos of their kids at the waterpark - Mike Frerichs popped in there. Guess what he was wearing? It wasn't a "Swim" suit... Look at that?!? Looks like Mike even got a little bit of sunburn on his face out at the water park. Good thing he was covered up otherwise. Got any other ideas for where we could find Mike Fererichs these days? Tell us via email. 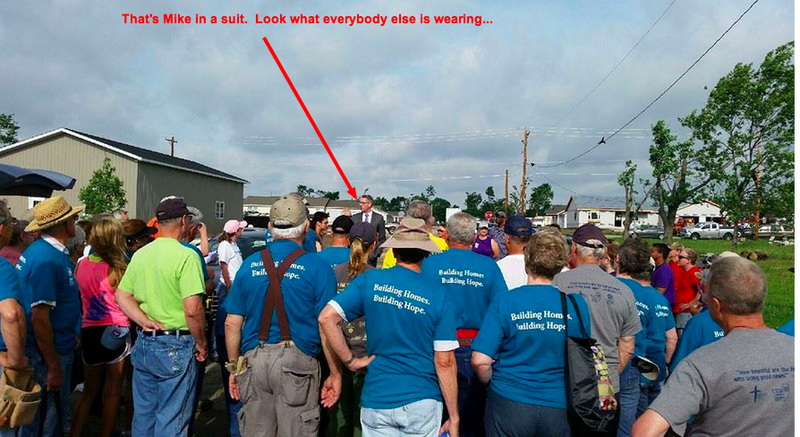 Who Shows Up at a Habitat For Humanity Build Event in a Suit? Mike Frerichs Does. Habitat for Humana does some incredible things. They rebuild communities. They rebuild lives. They energize local organizations. They marshall a lot of resources. They also get used from time-to-time by politicians who want a little piece of the spotlight. Democrat Mike Frerichs isn't afraid of trying to glom on to things. Especially when there are 'social media opportunities' to be had. There isn't a camera-ready-opp that goes by that Mike Frerichs doesn't seem to take. Last week, he was out at a Habitat build in his home town. Very admirable for him to participate. Oh wait. He showed up wearing what? A suit? SRSLY? Oh...It is pics you want? Don't mind if I do! From his Facebook Wall comes this doozy of a gallery. Talk about a guy who is out of touch? 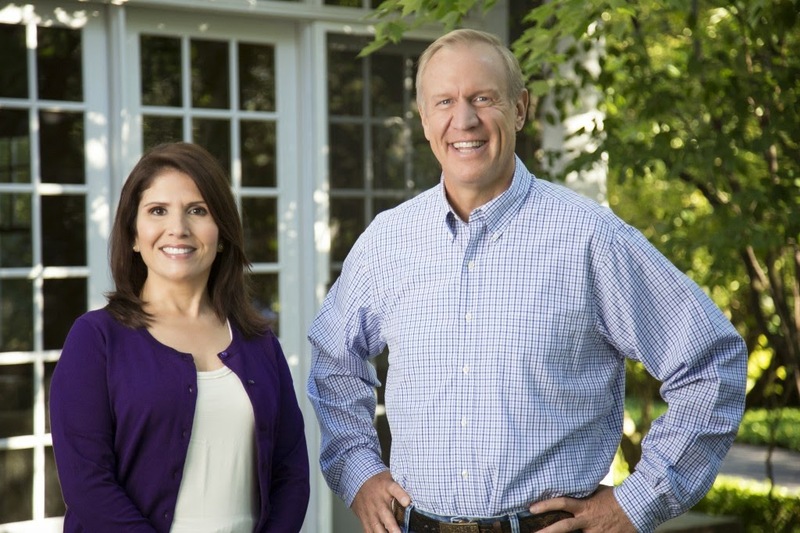 Call Bruce Rauner a phony all you want, at least he *gets it* with the Carhart jacket-schtick. Dressing appropriately for the occasion is politics 101. Hey...on the brightside...at least he's lost those embarrassing earmuffs. Nice pickup by Big Yellow. Caterpillar Inc. has hired former U.S. Rep. Ray LaHood to be its representative on policy matters, the company announced Thursday. 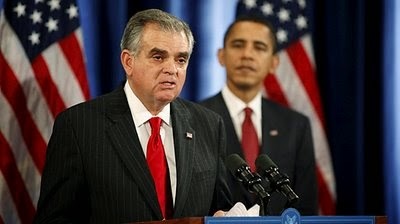 LaHood, who served as transportation secretary from 2009 to 2013, will serve as a consultant, providing advice on policy-related matters. “(LaHood) will assist Caterpillar in developing corporate strategies focused on identifying solutions to specific policy and communications challenges Caterpillar faces in the increasingly complex policy and business environment,” noted Caterpillar in a release.